The files can be filtered when added to backup. On the What do you want to backup page, from the Backup Wizard or Backup Properties -> Sources page each file and folder is shown in the tree with a checkbox in front of it. If you uncheck it, the file or folder will be excluded from the backup or restore process. After applying filters, each file and folder is shown in the tree with a checkbox in front of it. If you uncheck it, the file or folder will be excluded from the backup or restore process. The role of the filter is to restrict the files from the sources or destination that will participate in the backup or restore process. The filter actually consists of two filters: the include filter and the exclude filter. Include filter shows which files will be included in the backup or restore process. Exclude filter shows the files that will be excluded from the backup or restore. You can see the kind of filter in the Type column. By default, the filters are defined as include filters. If no filters are defined, then all the files and folders from the sources will be backed up or restored. To change a filter type from include to exclude or from exclude to include, just press the Change to Exclude/Change to Include button. There are special situations when the main filter is not enough to define the files to be backed up or restored. In this case, you can refine the filters adding individual filters for folders. The refined filter applies to all the files and subfolders of that folder. All files and folders for which a refined filter is applied are marked with red. To remove a refined filter, select the folder, select the filter and press the Delete button. The Edit file filter item window is shown every time a file filter restriction is added or modified. It can be opened by pressing the Add button from the Filters page (New Backup Wizard, Backup Properties, Restore Wizard window or File -> Options) or the Edit button (if filters are already defined). In the Filter name field you can type the name of the created filter. 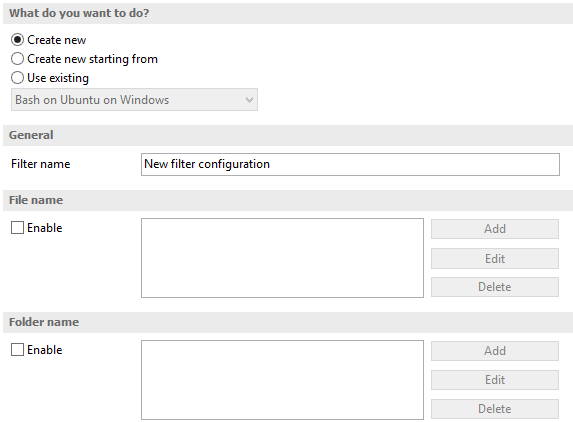 By default, the "New filter configuration" name is assigned. If you use an existing filter, the name of that filter is used. Enabling this will allow defining filters based on file name pattern. Press Add and select an existing file extension from the Filter combo (*.doc, *.pdf, *.zip etc.). If the extension does not exist in the combo, just type it in and press OK. You can use the Edit or Delete buttons to modify/remove the file name filters defined. Enabling this will allow defining filters based on folder name pattern. Enter the directory name that you want to filter in the following format: *\directory_name\* (leading *\ and ending \* are required). Backup4all will apply the filter to all the directories that are called directory_name. If you want to apply the filter to directories containing a specific word, you must enter it in the following format *\*keyword*\*. Now Backup4all will apply the filter to all the directories that have the word keyword in their names. You can use the Edit or Delete buttons to modify/remove the folder name filters defined. You can also use environment variables when creating filters: %temp%, %SystemRoot% etc. Enabling this section allows the user to specify file filters depending on the file attributes. FAT attributes - if this is selected, a set of File Allocation Table attributes will be used for file filtering. 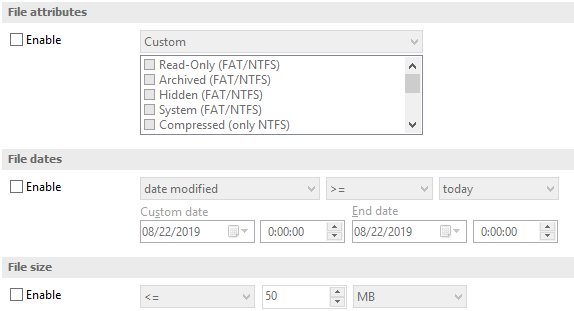 NTFS attributes - if this is selected, a set of NTFS (New Technology File System) attributes will be used for filtering. Note that these attributes are available only on Windows 8.1/8, Windows XP, Windows Server 2003, Windows Vista and Windows 7. For example, if you want to include files with read-only and archived attributes set, you have to check both attributes checkboxes in a single restriction. If you want to include files with read-only or archived attributes set, you have to make two separate restrictions: one for read-only and another for archived. This section allows the user to build restrictions based on file dates and times. To enable options in this section, check the Filter by date option. You can compare these dates and times with a fixed date or a relative date: today, yesterday, one week ago or one month ago. Filters on files and filters on folders must be created individually. If you use a file and a folder filter condition in the same filter, files will be filtered only if both filter conditions were met. If you use a single filter for .jpg files and Temp folder, only the .jpg files from Temp folder will be filtered. If you use separate filters for files and folders, all .jpg files and whole Temp folder will be filtered. Suppose you want to backup (or restore) all .pdf files accessed in the last month and all .doc files modified in the last week, but you don't want to backup (or restore) system or hidden files. For the last two restrictions, press the Change to Exclude button.